Read more about Danny, the young man featured in the video. In an effort to get into a team sport, my daughter tried a recreational softball league sponsored through our community center for one season. Though she was 11 at the time, I convinced the organizers to let her join in the 9-10 year old team since she was small for her age, had never previously played softball, and because of her disability. Overall, I believe the experience was quite positive. Because my daughter spent years playing tennis, batting was not a problem. Even though she batted with only one hand, it turned out that she was the best hitter on the team. And, because she could hit so well, she was usually able to get on base even though she ran a little slower than many of the other girls due to her AFO (ankle foot orthotic). 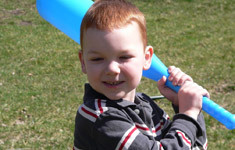 Get your child involved at a very young age, starting with T-ball. This will give your child the opportunity to develop skills and make adaptations when all children of that same age are beginners and all are making mistakes. It will also help your child make friends and become an accepted part of the team while the children are still too young to be concerned about disabilities and differences. Encourage your child to bat using both hands. This will not only help in arm, hand, and shoulder development; later on it is necessary to protect the chest from being hit by the ball as pitches get faster and wilder in older age groups. Though there are different methods, my daughter’s method for catching and throwing with the same hand was to catch the ball, then whip glove and ball backhand to the ground with force. As the impact usually caused the ball to pop out of the glove, she would quickly grab the ball and throw it to the infielder. Though she was slow at first, with practice she was usually able to accomplish this maneuver very quickly in a single smooth motion. Always have your child wear protective headgear with face/mouth protection. Softball and baseball become noticeably more hazardous sports at about 11 to 12 years of age when teams convert from soft-pitch done by kids, machine, and/or coach to fast-pitch by kids only. At this point, not only do the pitches get quite wild, many of the kids can be quite big in stature. Thus, the risk of getting hit by a wild, hard pitch goes up significantly at this point. 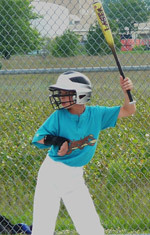 If your child hits with only one hand, requiring a more open stance, the chest is very exposed to a direct hit by a ball, which has the potential to cause serious injury.